A North American delegation negotiated the steep incline to a clinic draped over the roadway, like an olive tree from a limestone bluff. Cardinal Dolan, chairman of the board of Catholic Near East Welfare Association, led a delegation from CNEWA, including Archbishop J. Michael Miller of Vancouver, British Columbia, and retired Bishop William F. Murphy of Rockville Centre, New York. The group who visited health care facilities across the Lebanese capital on 16 April. Arriving by bus and after a brief climb, the prelates reached St. Anthony Dispensary, north of Beirut. The clinic offers medical services to locals and refugees in the Lebanese capital. Speaking with Lebanese Christians and displaced Syrian and Iraqi refugees at the dispensary, Cardinal Dolan held several children aloft as the delegation traversed a tight corridor, lined with white plastic chairs in which sat dozens of patients. The clinic, which is open less than four hours each morning, treats 80 people each day. Sevan Aziz, originally from Baghdad, visits the clinic regularly for her 82-year-old mother, who has high blood pressure. The dispensary, now in Beirut’s Roueisset neighborhood, was initially founded in 1987 in the Jdeideh el-Metn municipality to serve Lebanese Christians and Shiite Muslims who lived in the area but could not afford medical consultations or the cost of recurring prescriptions. In 2003, more than 400 Iraqi families settled in nearby Roueisset, overwhelming the dispensary with the community’s growing needs. The dispensary received additional support from the Good Shepherd Sisters, who had been working with area children since 1998. Today the 35 doctors employed by the dispensary work annually with more than 20,000 refugees, many of whom have fled the seven-year civil war in Syria and the recent occupation of the Islamic State in Iraq. CNEWA funds clinic projects, including the disbursement of chronic medications to more than 600 individuals who require prescriptions that treat Alzheimer’s, asthma, diabetes, hepatitis, epilepsy, osteoporosis, cancer and heart disease. Clinic officials say without CNEWA support, many patients needing medical services could not otherwise afford the $12 co-pay set by the Ministry of Health. The dispensary and its tertiary programs take a holistic, human approach to health care, said Sister Antoinette Assad, director of Good Shepherd Sisters. “Our motto is that religion is for God, the dispensary is for all,” she said. Sarouat Mourtada of Baalbek, Lebanon, sat in a chair cradling her 15-month-old daughter, who was there for a routine medical exam. “I asked around and they told me it [the clinic] was good, and they offer pediatrics,” Mourtada said. “This is the only clinic” nearby. The clinic serves a diverse population from more than 10 countries. “We hear so much about animosity between different faiths, but at these centers, we’ve heard people come together,” Archbishop Miller said. “The aspect of generosity and ability to receive others maybe makes us ashamed of how little we do” in North America. A side street conceals the Karagheusian Center, off a main thoroughfare in one of the capital’s most densely populated and industrial districts. A waiting room filled with patients momentarily paused as the delegation passed, before the room buzzed again with the action of care. The center in Bourj Hammoud, a predominantly Armenian neighborhood, is likewise supported by CNEWA and three Armenian churches. The center provides care for more than 3,500 patients each month. Serop Ohanian, the Lebanon field director of the Howard Karagheusian Commemorative Corp., said the government cannot provide many services, “so it has empowered organizations to do its job. “I’m grateful that we have the blessings of the church and the neighborhood churches,” he added. Mouhammad Hamid, 33, lost his vaccination card when he and his family fled Aleppo, Syria. A nurse helped him fill out a new card, with the help of a picture he’d taken of his card and provided to the nurse through WhatsApp. A short distant from the center, an Armenian church hosted the CNEWA delegation and more than 50 residents from the community, many of them refugees from the ongoing civil war in Syria, less than a two-hour drive. She said she hoped the church leaders would visit more often and praised them for their continued support. “We didn’t know when we came to Lebanon there would be people who welcomed us so openly,” Panoghlian said. Remember me, please, as this week I visit Lebanon, a country beautiful naturally and spiritually, a country unique in the tortured Middle East for its religious pluralism, peace — fragile though it may be — and amity among creeds. We know of their deep spiritual roots because we cherish our Maronite, Melkite, Armenian and Syrian Catholics who live as neighbors with us, and who call Lebanon their country of origin. As Archbishop of New York, I chair a superb organization called the Catholic Near East Welfare Association (CNEWA), which, for 90 years has generously assisted the ancient Christian minorities, especially in the Middle East. Lebanon has heroically welcomed hundreds of thousands of refugees from the horrors in neighboring Syria, and my brother bishops there have invited me to come. I do so gratefully and willingly, to bring your encouragement and assistance as well. I’ll let you know how it went next week when I get back. Last October, we placed in our cathedral, thanks to a benefactor of Lebanese origin, a chapel to the renowned Maronite Catholic holy man and miracle worker of Lebanon, St. Charbel. Would you ask his intercession for his beloved Lebanon … and whisper to him that I could use his guidance and wisdom while in his home country? Late Sunday, he posted the two videos below on his blog, chronicling some of the first day of his trip, including a visit to the shrine of St. Charbel and a chance to see the good work being done by our longtime collaborators in the country, the Good Shepherd Sisters. We hope to keep you updated in a days ahead with what promises to be an inspiring trip! While the word “formation” may not be familiar to most Catholic Christians — at least, not as an educational term — it is very familiar to seminarians and members of religious orders. 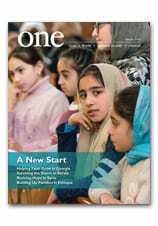 The current edition of ONE is focused (as the cover notes) on the subject of “Forming the Future,” so this is a good opportunity to explore just what that means and how “formation” figures in both the Church and the mission of CNEWA. Since Vatican II there has been a lot of discussion about the word “formation” — not the concept — questioning whether it is the best expression of what it is trying to convey. For many members of religious orders “formation” seems to imply too much passivity. A young priest or religious just sits back and “gets formed.” Unfortunately that has sometimes been the case, producing people who are often lacking in initiative and openness. In one of his talks, Pope Francis — who, in his many years as a Jesuit, has witnessed both the strengths and weaknesses of religious formation — spoke of formation sometimes creating “little monsters.” I think many of us who spent years in religious life can recall some of the “little monsters” in our past. While the discussion about the appropriateness of the word formation goes on, the concept behind it is accepted by all. Although CNEWA does not engage in actual formation — we do not staff or run seminaries, novitiates, etc. — we are, nevertheless, deeply involved with it in the areas where we work. This week and next, we will look at two different but related types of formation: the formation of clergy and religious and the formation of lay people. We will also see how CNEWA is involved in both. When a person enters a seminary or a religious order, there is a long process of formation which extends anywhere from four to ten years. The religious goes through different stages of membership in the community; the seminarian has increasing involvement in the diocese where he will serve. Formation involves personal growth, spiritual discernment and learning. For seminarians and most religious there is a lengthy, multi-year program of academic studies in philosophy and theology with required courses and electives. For most seminarians, this program covers a minimum of four years. While academic studies are extremely important — a primary principle of pastoral practice is to know what you’re talking about-- they are not the only element. Members of religious communities learn about the “charism” of their order. The “charism” is, among other things, the special spirituality of the community and the special aspect the community brings to the people it serves. Both seminarians and religious have to learn how to live authentically and as adults among the people we are called to serve. Among other things, the formation of seminarians and religious helps them to deal in a healthy way with celibacy and how one serves credibly and with sensitivity in a community where most believers are not celibates. They learn how to be what St. Paul calls “all things to all people so that they may be saved” (1 Cor 9:22-23). While the word “formation” may or may not be the most appropriate, the goals it seeks to achieve are extremely important. Formation programs provide the service corps of the Church. They produce clergy and religious who are educated, articulate, pastorally committed and authentic. While clergy and religious are not the only people involved in the Church’s mission (as we shall see next week), they form a critical part. It should be obvious that formation programs require that local churches and religious communities commit a great deal of resources to them. Somewhat crudely put: good formation programs are not cheap. They requite residences, faculties — people who teach and inspire — and books, to name just a few. In all the regions from southern India to Eastern Europe, the Middle East and northeast Africa, CNEWA helps the local church educate, train, prepare — in a word, form — the leaders of the Church of the future. It is a long-term investment that literally takes years to bear fruit. However, the future of Christianity depends upon it.